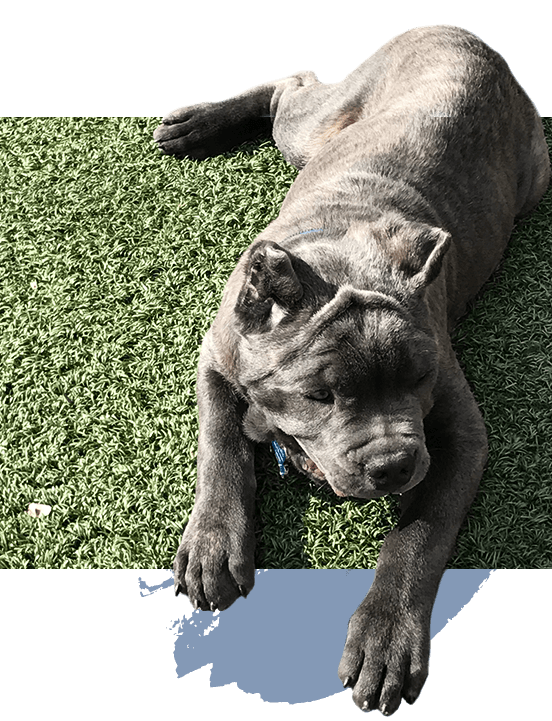 (Officially Xander of Mt Vernon) is an affectionate and loving Blue Brindle Cane Corso, with an impressive pedigree and an endless supply of puppy love and kisses. His happy place is Hotel Indigo Baltimore Downtown, a proudly pet-friendly hotel in the city. Xander just loves greeting guests and playing with kids. He even used his puppy charm to arrange a "Bring Your BFF Package" for fellow canine friends, that includes delicious doggy treats and free admission to nearby Howard’s Park Dog Park. Each morning Xander and his human, GM Jason Curtis, walk to the hotel just a few blocks from their home. At lunch time, Xander enjoys cruising to the off-leash dog park two block away and hanging out with friends. Thanks to his big personality, low key vibe and amazing intelligence, Xander is popular wherever he goes. His motto is play hard, sleep well, repeat! Hard-working and ambitious, Xander is attending K9-Koncepts Training Academy and has already graduated with honors from puppy school.